We offer a unique & truly special hen party catering experience brought direct to you. Combining a personal chef hire service with restaurant quality cuisine, Dineindulge is designed to be affordable, accessible & simple to book for you & your hen party. 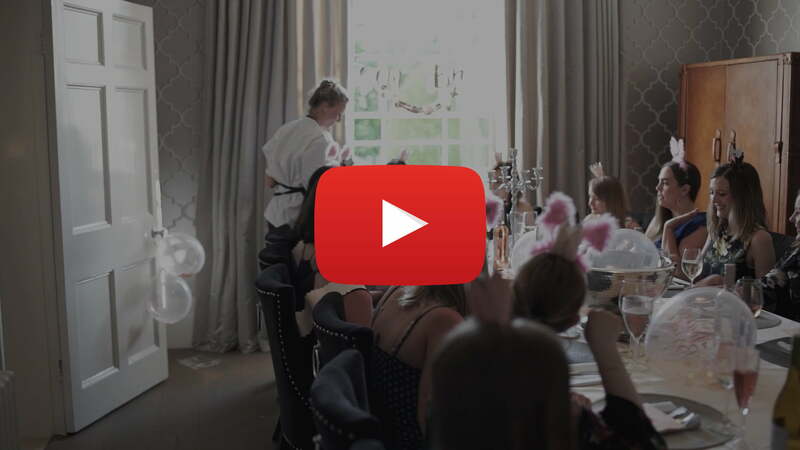 An amazing hen party service! Daniel our chef was magnificent, cooking some brilliant food for our hen party whilst being super professional and friendly. I wouldn’t hesitate in booking Dineindulge next time I’m arranging an event. I cannot praise Dineindulge’s hen party catering service highly enough. Sam the chef was absolutely brilliant, he did a fantastic job and couldn’t have been more helpful with several people requiring different things due to dietary requirements. The food was delicious and Sam left the kitchen spotless when he left too. Thank you to him and the whole team. Our hen party catering experience with Dineindulge was exceptional. Our chef was a total surprise as we did not expect the food to be as good as it was. It was a real treat and as good as any restaurant I’d ever been to. Big thanks to everyone from the team for organising this for us, it was the highlight of the hen do. The aim of our service is to make the booking process from choosing a menu to the arrival of your private chef (at the place & time you want them) as quick & easy as possible for you. Select the location, date & estimated no. of guests for your event. Browse our delicious selection of set menus & choose one to you liking. On selection the full price of the booking is displayed for you. Once you’re happy you can book & pay for your order securely online. Select any menu, pay just a £60 deposit & change your menu choice up to 14 days before your party. Sit back, relax & we’ll organise the rest for you. All that is left for you to do is confirm the time you want your hen party catering & your full event address. You’ll be sent an email requesting this information as well as asking for any dietary requirements and individual menu choice selections. If we have any questions we’ll contact you (but we’re open 8am to 6pm Monday to Saturday if you need us) & your chef will call you the week of the hen party to introduce themselves & answer any questions you may have. On the day of your party, the chef will arrive approximately 2 – 4 hours (depending on the menu) before the start of service. The chef will bring all the ingredients to prepare the meal in your kitchen. They’ll cook you each dish and then clean down the kitchen after. Please note. For small groups (below 10) the chefs may have time to serve each course to you but for larger groups, if you require table service, you may want to book a waiter. If so just ask your event manager who will happily do this for you through one of our preferred suppliers. Got a hen party catering question for us? Get in touch.